I do not intend to make recipes a regular topic on Raptitude, but if quality of life is the theme, these are just too good to leave out. Making chocolate chip cookies is something I do very well. Because I live alone, I don’t make them often, but I receive many compliments every time I do make a batch and share them. The chocolate chip cookie is definitely the most frequently encountered cookie in North America. They are commonly used by grandmothers to spoil children, and by children to bait Santa Claus. It is the official state cookie of both Massachusetts and Pennsylvania. I don’t know how impartial I can be, but honestly I have never encountered a better chocolate chip cookie than the ones I make. It could just be my own taste. They are so addictive I have to distribute them to friends and family as quickly as possible, before I’m taken captive by their seductive, brown-sugary fragrance and their irresistible satin glow. Sometimes I overindulge and start eating them for breakfast and lunch. If there is a superior cookie out there, then God help us all. 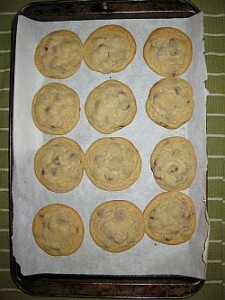 My own recipe evolved as a hybrid of two glorious specimens: my mom’s chocolate chip cookies, and Martha Stewart’s. I’m not a fan of Martha, but nobody can deny she is an expert at what she does. I took the best aspects of each cookie, then experimented, sampled, refined, and sampled my way to a final formula. I was asked not long ago if I wanted to contribute my recipe to a cookbook someone was putting together. I was uneasy at the thought of unknown people trying to reproduce my cookies simply by following a short-format recipe. To achieve the full majesty of the perfect cookie, certain steps must be explained more explicitly than is appropriate for a standard recipe card. I did not want people making assumptions and cutting corners and ending up with ordinary cookies instead, and concluding that I exaggerated when I told them they were truly special. I have not shared this recipe until now, but on Raptitude I can call all the shots. I can use a thousand words in a recipe if I have to. Details matter immensely to me in life, and I’m convinced it’s never more than a few details that make the difference between something good and something exceptional. Mix everything except the flour and chocolate chips until uniform. Squish any lumps with a spoon. If you’re using an electric beater, make sure you stop periodically to scrape all the unmixed ingredients off the sides of the mixing bowl. Add in some of the flour (maybe a third of it) and mix until uniform. Continue until all the flour has been added. Don’t get lazy and add it all at once; this detail matters. When it is again uniform, mix in the chocolate chips. Roll into golf-ball sized spheres and place them on a cookie sheet. They don’t have to be perfect spheres. As for the cookie sheet, you can do it the old fashioned way and grease it with oil or butter, but I highly recommend that you instead place the balls on a layer of parchment paper. This way you can remove them easily without risking damage, and it will protect the cookies from absorbing the smell of french fries and samosas or whatever you last used your cookie sheet for. Parchment paper also seems to add a mysterious je ne sais quoi to the color around the cookie’s edges. It can be found somewhere near the wax paper in the grocery store. Put them in the oven on the middle rack for 8 or nine minutes, depending on how big you made them. Check in at 8 minutes, in any case. The time to take them out is when the middle of the cookie stops looking wet and shiny and starts looking satiny. Satiny is the only word that works here. You will know satiny when you see it. Let them cool. Serve with milk, if circumstances allow. Yields 3 dozen. Keep in a sealed container. Originally I used butter and shortening interchangeably, depending on what was on hand. I found that I preferred the flavor when I used butter, and the texture when I used shortening. Now I would never leave either out. Most recipes use only butter, and this gives a more hardened, grainy texture in my experience. Traditional cookie doctrine calls for less brown sugar than white, sometimes 3 parts white to 1 part brown. I figured this was unfair to the brown sugar, which has always been far more charming and exotic than our pedestrian white sugar. I decided to give it equal standing with its caucasian cousin, and the world became a better place. These cookies are not healthy. At all. They’re only a slab of shortening away from being eligible for This Is Why You’re Fat. I know many of you are already loyal to a particular chocolate chip cookie recipe, and I don’t want to encourage any infidelity. But if you are without an emotionally-invested cookie recipe — or you’re the type that insists on not being tied down by traditional arrangements — I urge you to give these a try. The most gratifying part is always sharing them. Best served unexpected, with no special occasion to speak of. I love to cook, so I will certainly try these soon. Thanks for sharing them! .-= Frances´s last blog ..Standing on the Shore =-. David, that’s exactly what I’ve been missing in my life… “an emotionally-invested cookie recipe”! So far I’ve been getting by on the Tollhouse recipe that comes on the bag of morsels, but it simply does not nurture my soul. I’ll have to give these a try and see if they do, in fact, complete me. .-= Lisis´s last blog ..Adventure: From the Heartland to the Front Lines =-. You know, I think I’m going to adopt these as my own as well. Because when I get the dough from the store, I just end up eating the whole thing straight out of the bag, since the cookies themselves aren’t much to speak of. Prepackaged dough is crap! Make the real deal. The dough alone is spectacular. I have more memories of baking those particular cookies than probably anything else I’ve made in my entire life. Your statement at the end, “The most gratifying part is always sharing them. Best served unexpected, with no special occasion to speak of.” I loved. It applies to many things – including random acts of kindness. Your recipe is identical to mine (I totally agree about the butter and equal sugar!) with the exception that I do not add salt to cookies – ever. .-= suzen´s last blog ..Starting Over and Getting the Critic OUT =-. Thank you for sharing a valuable part of your knowledge. You cannot go wrong having one of those for breakfast. If it is indeed the most important meal of the day, then by all means it should begin with something extraordinary and special. Life is good! .-= Nadia – Happy Lotus´s last blog ..Vacation State of Mind All the Time =-. This comment made me laugh out loud, thank you. I hope they do nurture your soul. And if they don’t feel free to modify the recipe with your own preferences. Maybe you will hit on something even better. I encourage people to help humanity by means of conscious cookie evolution. Suzen — Wow that’s amazing that you discovered the same arrangement. I do like the salt, but they’d certainly be fine without. I love the combination of salt and sweets. Prayerthegate — Yeah one cookie couldn’t hurt for breakfast. I’ve got some dough left in my fridge, maybe I’ll do one up for breakfast tomorrow. Nadia — Heh, I have already discovered that. Women are always way more impressed than men. I do have two other special custom recipes that I make from time to time, I’ll share them eventually. Tina — Awesome! That’s so cool that you made them. Enjoy. Please share this recipe with anyone who you think would appreciate it. 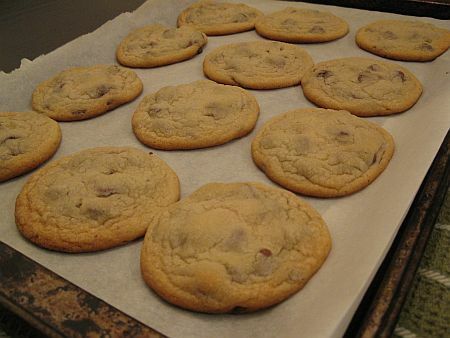 .-= David Cain´s last blog ..How to Make Exceptional Chocolate Chip Cookies =-. I’m so glad that made you laugh! You need to keep the fun in your life during all these crazy changes you are going through. .-= Lisis´s last blog ..Dear Blog: It’s Not You, It’s Me =-. I was thinking along similar lines as Nadia … in the sentence you said you lived alone and you cooked large numbers of awesome cookies … and I wondered if they are part of your pick-up routine? David meets girl, ‘I make the best cookies in the world, wanna come up and try one?’ ??? Something like that? I have a request. I adore chocolate chip cookies. Really. Most of us over here in Europe do! And I would love to try out your version. Could you translate ‘C’ into European measures – I’ve tried several US based recipes before and I can never figure it out? And what is ‘Shortening’? And I’m assuming the oven temp is in Fahrenheit? .-= Ian | Quantum Learning´s last blog ..Heart of business =-. .-= Stephen – Rat Race Trap´s last blog ..Well-Being is Better Than Happiness =-. Ian — We’re on the metric system here in Canada, but for some reason we’re still hung up on Imperial in the realms of cooking and architecture. A cup (C) is 237mL, a Teaspoon (tsp) is 5mL. The temperature is in Fahrenheit, yes. 350 F = 177 C.
It’s just solid cooking fat, either from vegetable or animal sources. Over here we call it lard if it’s from an animal. I will be making these as soon as I get back from work tonight. Oh lordie I can’t even wait. My mouth is already watering. I’ve only ever tried the recipe on the back of the Chipits package, so thanks!! A friend sent me the link for the cookie recipe. I too had found the combo of butter and shortening makes the best texture and flavor. On the subject of salt, I think there is some chemical reaction factor that makes it a proper ingredient, (we would have to consult Alton Brown on that one.) I know when making some candy recipes if you leave out the salt it won’t come out right. One detail seems missing in the recipe. At what point do you add in the chocolate chips? As far as salt goes, I have never tried them without. I’m not sure if it plays a chemical role in the cookies or just a physical one. I’ve never made candy but it seems to be a more delicate process. The satiny phase lasts about one minute. “If there is a superior cookie out there, then God help us all.” – favorite quote from this article! I can’t believe I am just now finding this….read my religious views…. I am making these this weekend!